Why is STEM literacy important? The engineering design process is a method for determining how to meet a human want or need, or how to solve a real-life problem. There is no set list of steps in the engineering design process, but there are some common components. Designers must identify what problem or need the design is to solve or meet. Constraints such as time, money or resources are often considered. Ideas are researched, designs are created and tested, evaluated and redesigned, then finally presented to a client or audience. Often a design process is pictured as a loop. Although the loop will vary in complexity for early and later elementary students, a typical engineering design loop might include these steps. The design process can easily be used by a teacher as a guide to follow to keep the project on course. 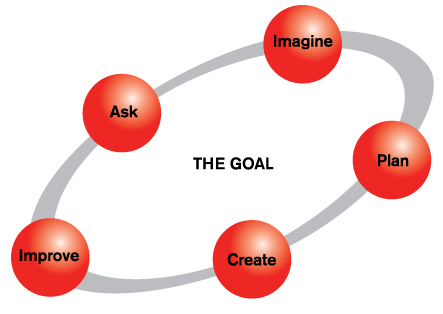 It also provides students with an outline of how to solve a problem or design a solution to a want or need. The design process will help students see the overall structure of how to solve the problem and give them specific steps that will help them focus and optimize their work on the project.